A stunning bride, designer wedding flowers and wedding reception flower designs were exquisitely matched for this winter wedding in London at the Queen Mary Undercroft, by the Old Royal Naval College, Greenwich. The classically lavish and historical setting offered a delightful backdrop to the parents and proud family of the bride and groom. 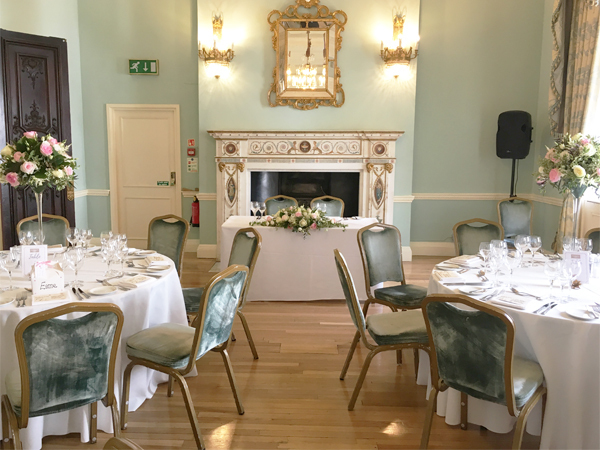 The bride’s vision and our London florists’ wedding flower ideas for winter were perfectly complemented by the majestic stone columns, a complete built-in bar, large dance floor and vaulted ceilings from which hung romantically lit crystal chandeliers. Here, in an atmosphere of elegance, their beautiful ceremony was followed by dancing, fine music and a catered reception. We probably have to take something of a breather after such a breathtaking and gorgeous display of wedding flowers! Not to mention the outpouring of love, family pride, display after display of flower arrangements for weddings…and oh, yes, all the fun! We witnessed a lot at this bride and groom’s wedding, and here it is–or at least as much as we were able to capture!–for you to appreciate and feel inspired. 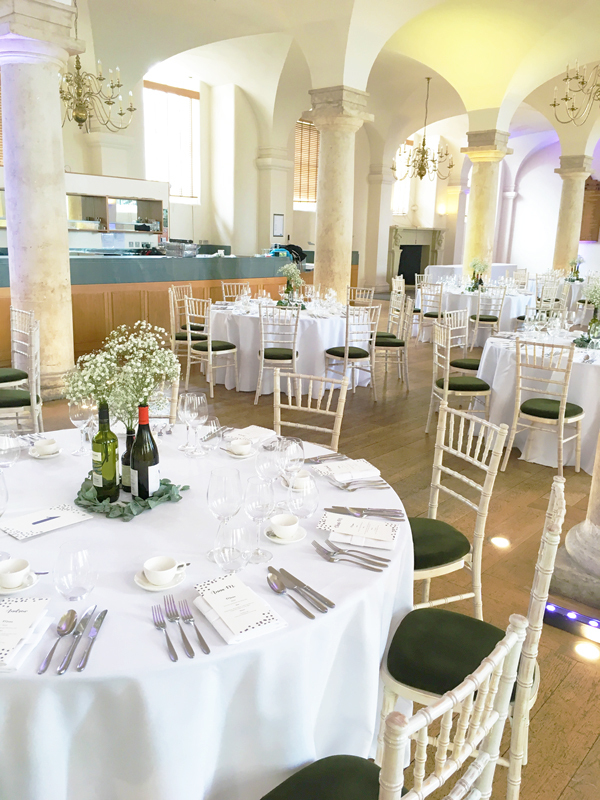 On the day of the wedding, the main hall at Queen Mary Undercroft, located at the Old Royal Naval College in Greenwich, was decorated with crystal, crisp white tablecloth and parchment stationery, and of course fabulous wedding centrepieces. 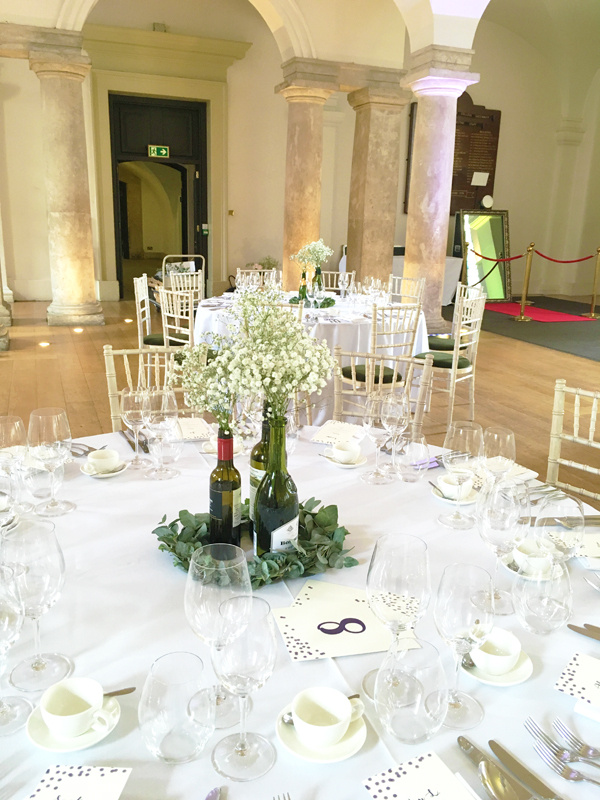 The flower arrangements at the reception for this wedding were made from Baby’s Breath (or gypsophila) flowers, arranged with eucalyptus, and displayed simply in wine bottles placed and centred at guests’ tables. The bridal bouquet was a dreamy sight indeed composed of sweet avalanche roses, Duchesse Nemo white peonies, White irises, Baby’s Breath and eucalyptus. Every one of the wedding flowers ideas were carefully planned and discussed beforehand. 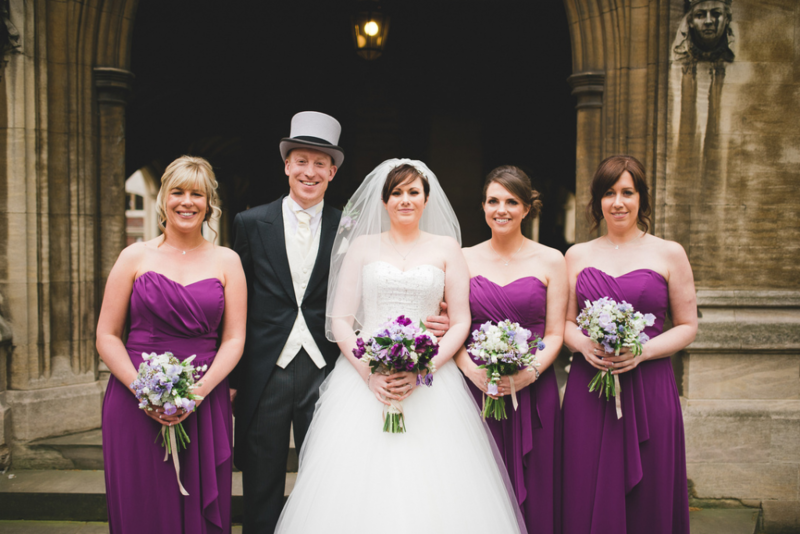 Bride and groom were able to share their wedding arrangements ideas with expert designers and London wedding florists. 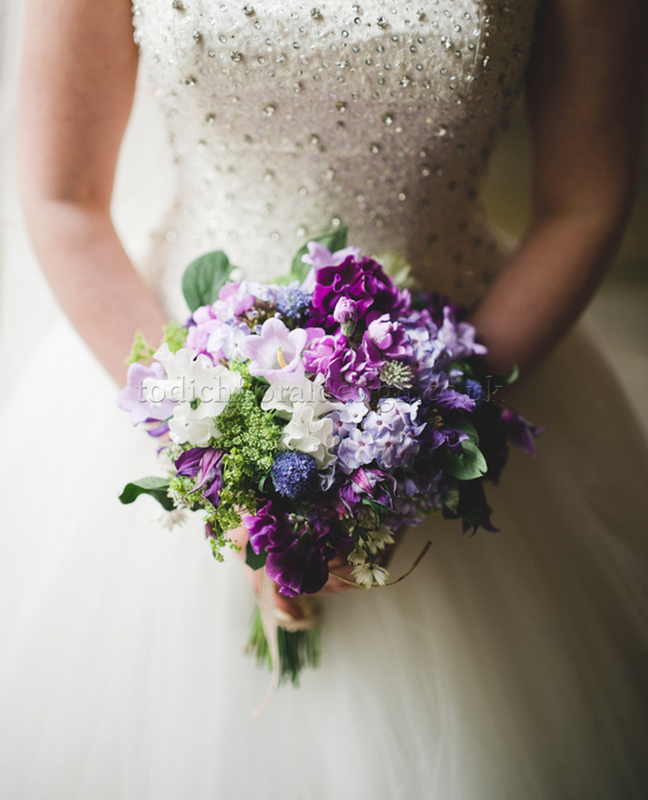 And each aspect, every wedding flower, bridal bouquet types and colour were purposeful in detail, including the bride’s flowers, her bridesmaid bouquets and the wedding reception flower designs. 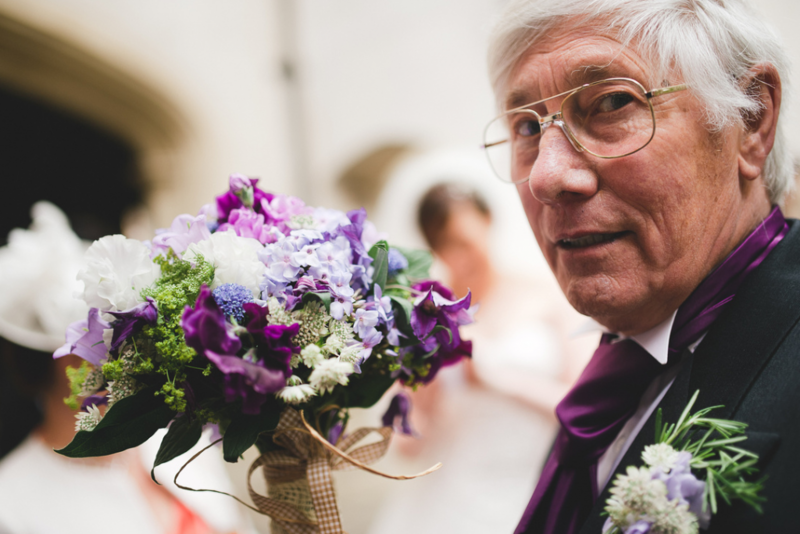 “Wedding flowers can consume a large part of your wedding day budget, so it is important to select flowers that reflect the theme or colour palette of your day. 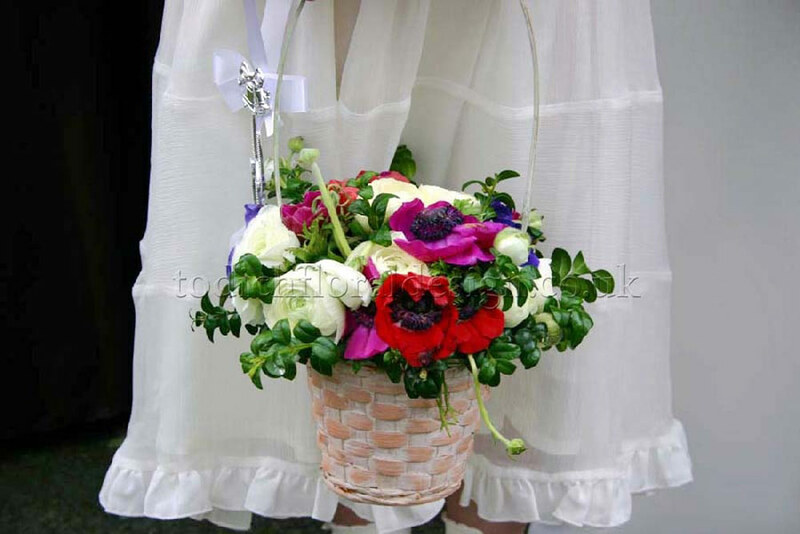 The use of flowers in your wedding day also can reflect the personality of the couple, purity and happiness. Often, couples choose wedding flowers by wedding season, and by bringing their own ideas, history, special memories and personalities into the equation, wedding flower decorations are always unique. Something extra special and touching to behold about these wedding flowers and decorations was how the couple mingled special moments in with the wedding reception flowers. Entering the reception hall after the ceremony, wine bottles were displayed on each table, each filled with delicate sprays and sweet clusters of Baby’s Breath wedding flowers, because the groom had proposed to the bride while they were on holiday at a vineyard in France. Also, in honour of the bride’s mum, White Irises were used in both the bridal bouquet and other floral designs for the wedding reception. 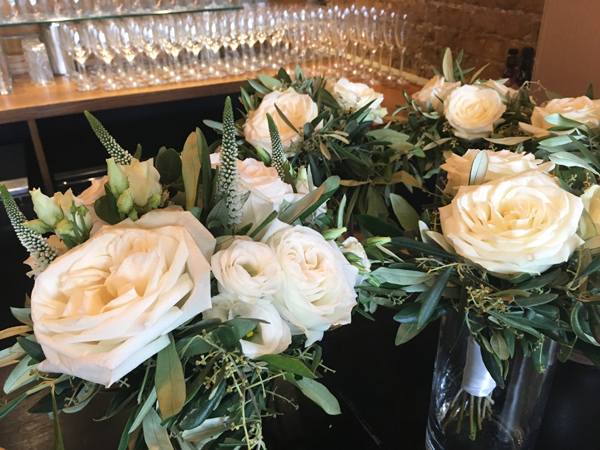 If you love elegant simplicity, classic pastel wedding flowers decoration, traditional bridal bouquets and white wedding flower design, then ask us more about this London wedding at the Queen Mary Undercroft. 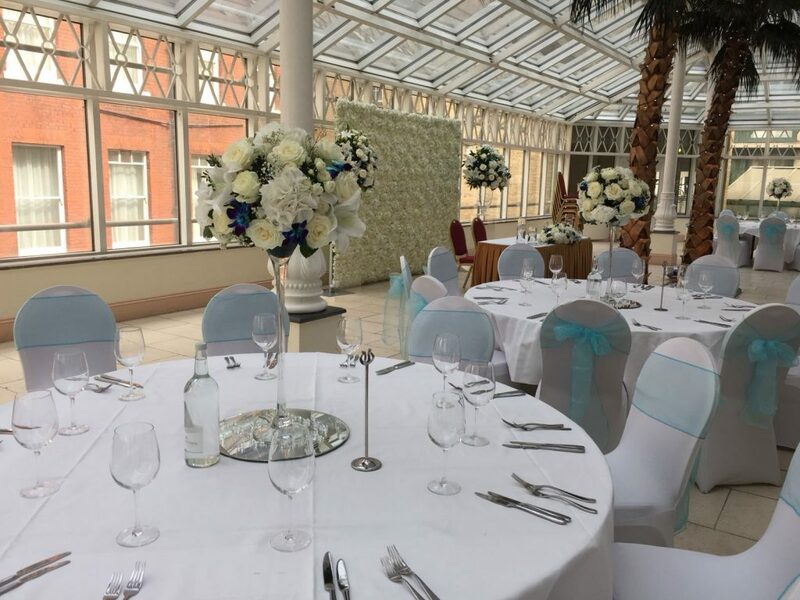 Our ecstatic and lovely bride and groom Tara and Simon were overjoyed to celebrate their summer wedding with a glamorous reception at the Millennium Gloucester Hotel at Harrington Gardens, Kensington in London. We adored every piece of their June wedding decor. For this couple’s wedding reception design there were a range of lushly textured white blossoms with green foliage and blue accents. It was perfect, from the flowers for bridal bouquets, the bride and groom’s table and wedding centrepieces, to the dashing silhouette cut-outs on their cake. MR. & MRS. in exquisite calligraphy, while a figure of the groom swept up his bride, lifting her into the air for a kiss. The wedding flowers design reception was held in the conservatory, a gorgeous setting that received plenty of natural light, crisp and bright and full of the latest floral fashion, with modern accents and this summer’s best wedding decor. Props like martini vases, large clear urn style vases and clear plinths meshed a contemporary aesthetic with some of our favourite classical elements. It left an open view of a blue sky and surrounding architecture. Our designs created for the bridal bouquet, bridesmaids bouquets, floral buttonholes and corsages and the flower girl’s pomander–she was adorable!–all captivated guests’ attention. The bountifully bright wedding flowers bouquet designs and flowers on plinths behind the top table brought an ethereal lightness and regal sensibility to the celebration. 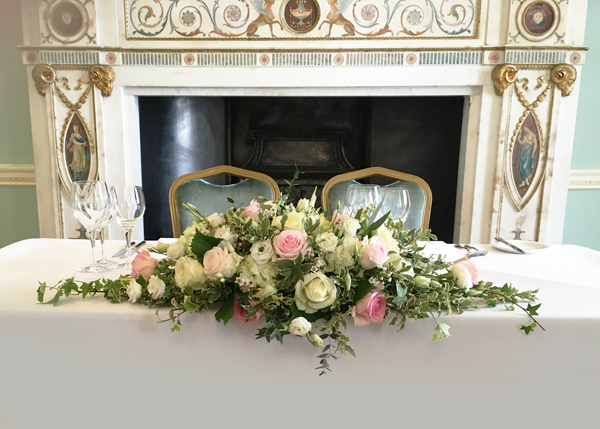 Roses, Baby’s Breath and orchids found their way into top table design even after the ceremony, for divine wedding reception flowers. It carried over the joy and love of our bride and groom who were all too happy at their table looking out at friends and family and appreciating their wedding decor. Then, it was wonderful to see them share that romantic first dance! The wedding flowers used were part of a largely monochromatic palette—white like pure sunshine, clouds spread thin like stretched cotton, sprawled across a blue summer sky. Table design flower arrangements and wedding centrepieces incorporated white oriental lilies, white avalanche roses, Baby’s Breath (or gypsophila), spray roses, purple and blue tone dendrobium orchids and mixed green foliage. With bride and groom at the top table, sitting in appreciation and high style and clear adoration of each others’ company, there was simply nothing better. It was all we could have wished for in the perfect summer wedding. A beautiful spring afternoon and an abundance of wedding flowers greeted the overjoyed couple for their Century Club wedding, Shaftesbury Ave, in Soho. Early spring is always a wonderful time for wedding flowers by season but this was a particularly beautiful, joyous and picturesque wedding venue with cerulean blue skies, visible buds, new blooms and greenery complementing the grounds. Wedding reception decorations matched perfectly with the blend of traditional and modern, as the venue is situated adjacent to St. Anne’s Church. Pure bright light poured in through windows, illuminating wedding flowers and the absolutely stunning bride alike, for a ceremony that left guests, close friends and family touched and rapt as she strode down the aisle. 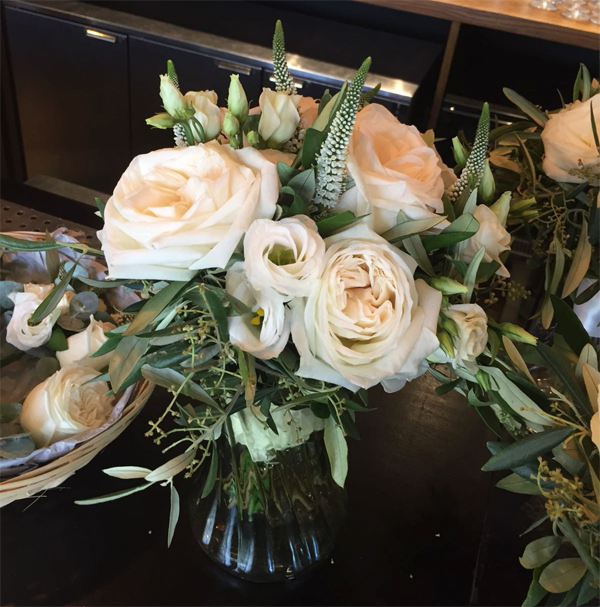 Wedding bouquet designs and fresh bride bridal bouquets are no easy task, but at Todich Floral Design we rise to occasion for every one of couples. Every blossom in place and petal and piece of foliage is worth it. 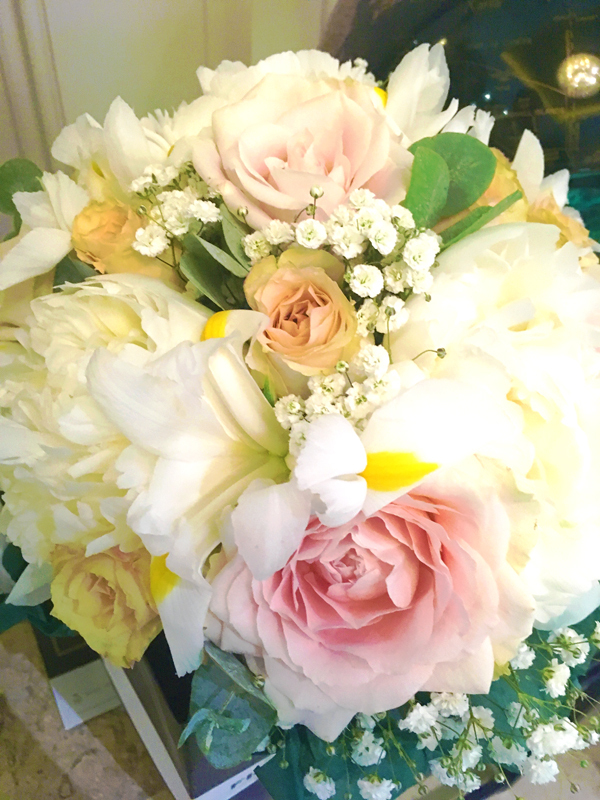 For these Century Club wedding flowers we worked closely with the bride to design a beautifully arranged bridal bouquet. Flowers for bridal bouquets here were David Austin Patience roses, white lisianthus, wavy and vibrantly clustered Veronica flowers and olive foliage. After the bridal florist put together this stunning floral arrangement, the bride herself borrowed a precious family heirloom–a beautiful brooch–that was added to the ribbon. Complementing the bridal flowers to perfection on this sunny spring afternoon, the bridesmaid bouquets were just as they should be. Top designer wedding flowers in London were part of the process and discussion with the bride leading up to her wedding day. She and the florist selected from several favourite bridesmaid designs, and in the end chose large head white avalanche roses with olive foliage. Because of the delightful weather, the wedding party and guests were able to enjoy the outdoors. Members of the wedding party were exquisitely dressed, with wedding flowers buttonholes and wedding corsages to match the bride’s flower choices and other wedding reception decorations. Snippets of conversation, laughter, compliments to bride and groom and guests wishing them well could be heard before the wedding ceremony. Soon it was time for the ceremony to begin. The wedding flowers ideas were a combination of crisp, classic spring bouquets, accouterments, candle light and modern wedding arrangements, popularly seen in church decorations for weddings in London. As the bride walked the aisle there was a stunning backdrop of wedding flower decorations. These were created from a mixture of vintage bottles and jars hanging from the high ceiling, which had been filled with rose heads and candles. A magic, romantic glow to light her way! More wedding flowers lanterns decorated the aisle, along with candles and freshly scattered rose petals. The bride was smiling and so were we as she approached the altar to be greeted by her groom. What more could you ask of wedding flowers? And a ceremony designed to perfection. If you're using this wedding as inspiration for your own. 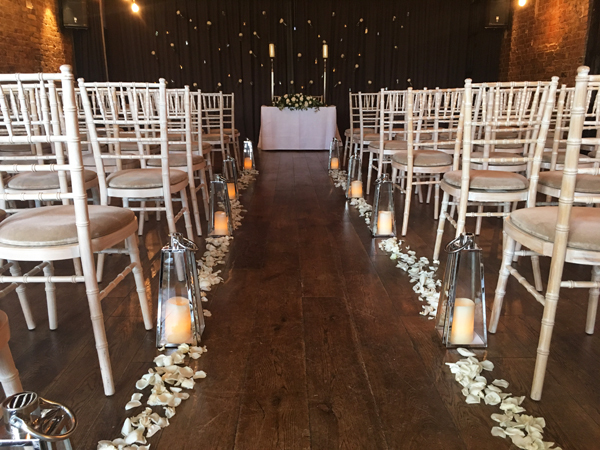 Allana Frisken, Wedding Planner for Darling Don't Panic advises "You do not need to have flowers absolutely everywhere at your wedding to make the space look great. Strategically placed lower arrangements are a great way to add flowers to tables without overwhelming the space. You could also add other styling elements such as candles, table runners or even copies of your favourite books to get a fantastic look. Speak with your florist or stylist about how to achieve your desired look while still keeping within your budget." 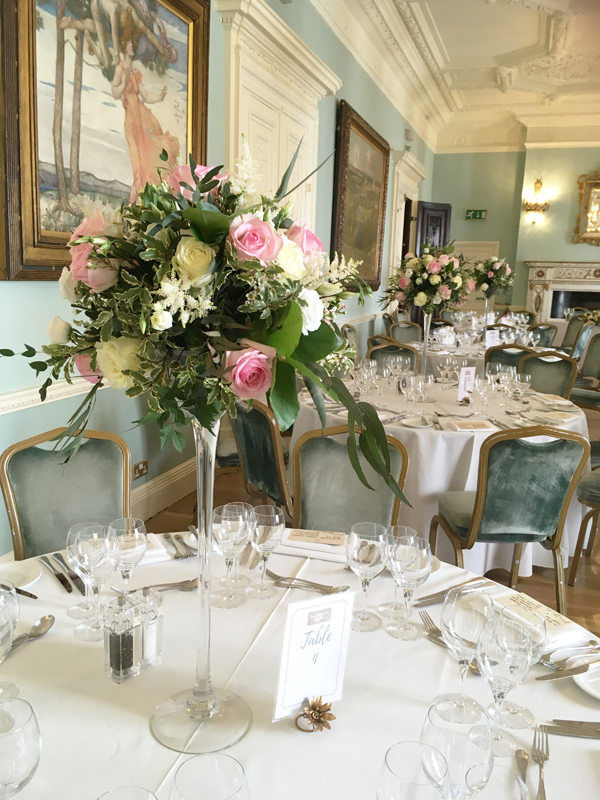 Please get in touch if you would like to ask questions about this wedding at The Century Club, designer London wedding flowers, or wedding flowers prices from Todich Floral Design. We’re all excited about summer. It is a season I love for its energy, the bright colours, and the summer-specific creative designs we incorporate into our floral displays. For corporate clients it is a wonderful opportunity to showcase their products and services, market to new customers, and harness a portion of the seasonal excitement–not to mention take advantage of the incredible array of in-season flowers and arrangements we have to offer. 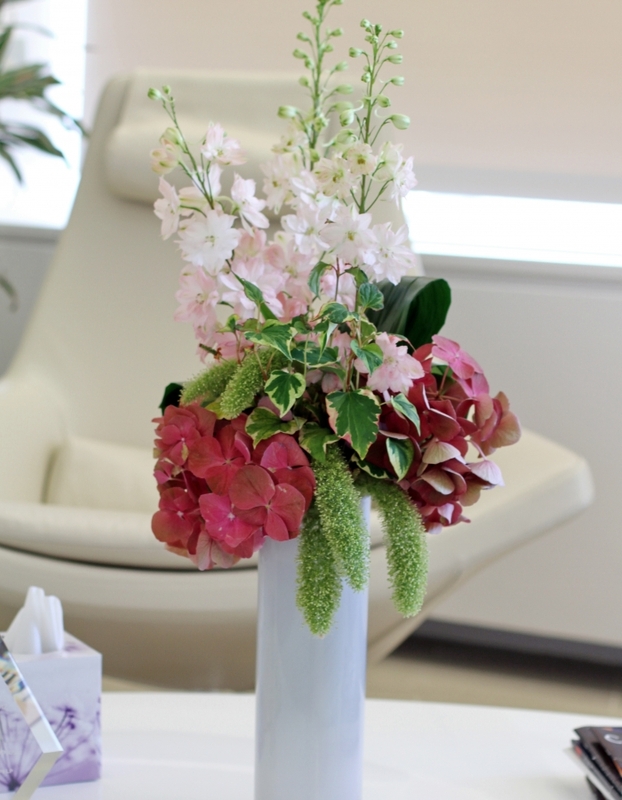 There are many reasons to add greenery to your office. As Andy Baxter, MD and Green Design Expert at Internet Gardener explains: "The future of office design is green. Bringing the outside in is growing in popularity every year with businesses realising the vast benefits nature and plants can have on productivity and wellbeing as well as showing off their eco-friendly side to potential clients, employees and guests. "Studies every year prove that having plants and greenery in a work setting, whether full office or home desk, improves productivity in people whatever they're working on. Businesses are now often turning to biophilic design, often incorporating living walls. These often take form in wall sections covered in plants, artificial or genuine, or vines, with pockets of grass and moss that grow into the wall. Brightly coloured plants poke out of holes and grow to change the wall's design over time. 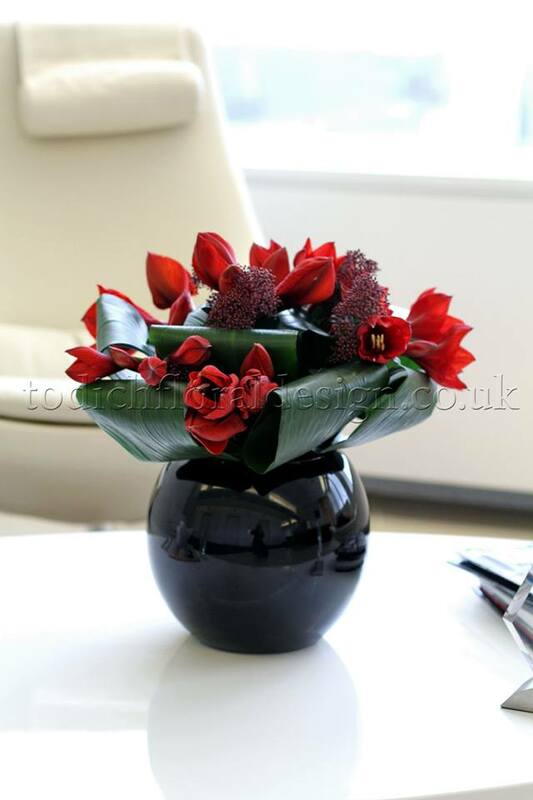 "Plants have also been proven to produce a calming atmosphere which can be integral to many high-pressured offices." Large table arrangements are often part of a customer or clients first impression, whether he or she is walking into your lobby, waiting area, or the front of your restaurant. For summer, I love branches. I love blossoms. I think this season you can see classic arrangements, such as roses and ranunculus with filler flowers, as well as minimalist arrangements that make perfect use of just a few tall, enticing tropical flowers. Did you know it was possible to dress up your cubicle? The miniature trellis is perfect to hang English ivy, fresh cut flowers, or silk flowers if you want something you can leave up as permanent decoration, for summer and year round. Hydrangeas are extravagant. They are exuberant. They are some of my favourite flowering shrubs to use in summer arrangements. 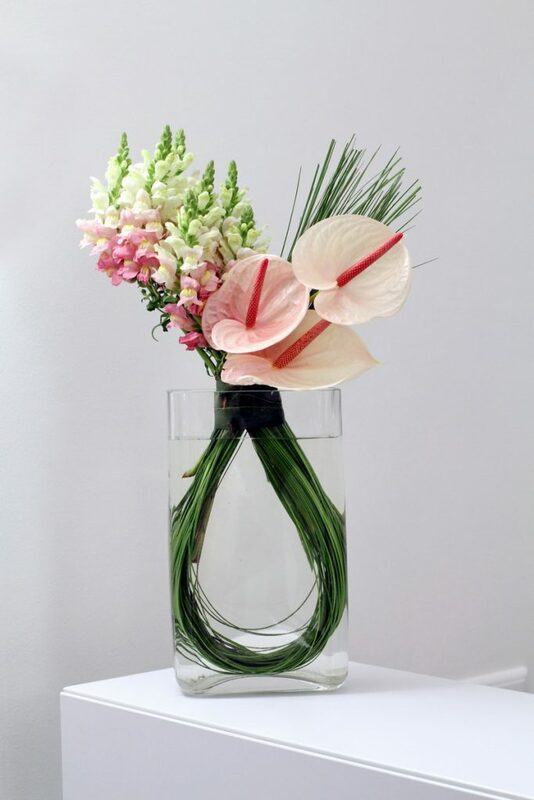 Their clustered blossoms are versatile and easy to arrange. Combining them with cascading green foliage is perfect for one end of a front desk or a large table reception in a reception area. What’s an easy way to make clients, guests, and colleagues feel at home? Or maintain a comfortable environment for customers? Ivy, flowering shrubs, succulents, potted plants and bonsai trees are my top picks for indoor plants. And Indoor plants provide a host of other benefits, from cleaner air and less stress to more moderate air temperatures. All of which make a big difference during the summer. Bring some part of summer inside by turning your office space into greener space. Miniature rose bushes, azaleas, philodendron, ficus, giant snake plants–any one of these large potted indoor plants won’t require too much effort to maintain. 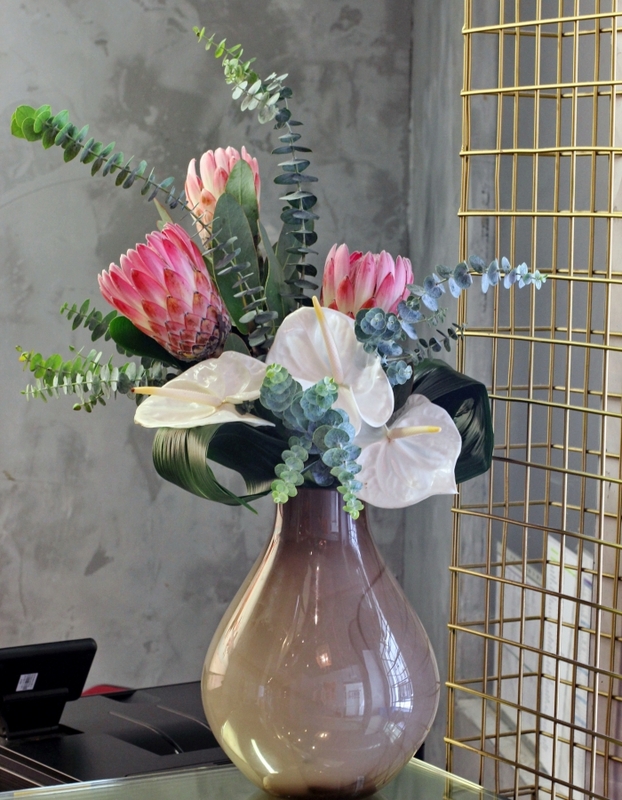 Fish bowl arrangements, flowers in simple vases–these are the small touches that can make a big impression on the people who come in contact with your business, before you even exchange words. Wild bright green grasses wrapped around the circumference of the bowl add colour and texture. You can float whole rose blossoms, or just the petals. Lotus flowers are a classic choice. Calla lilies swirled around the bowl are another popular selection. How will you handle a first impression on guests and VIPs? Summer flowers are naturally bold, bright, ecstatic. They help you make a statement, naturally. 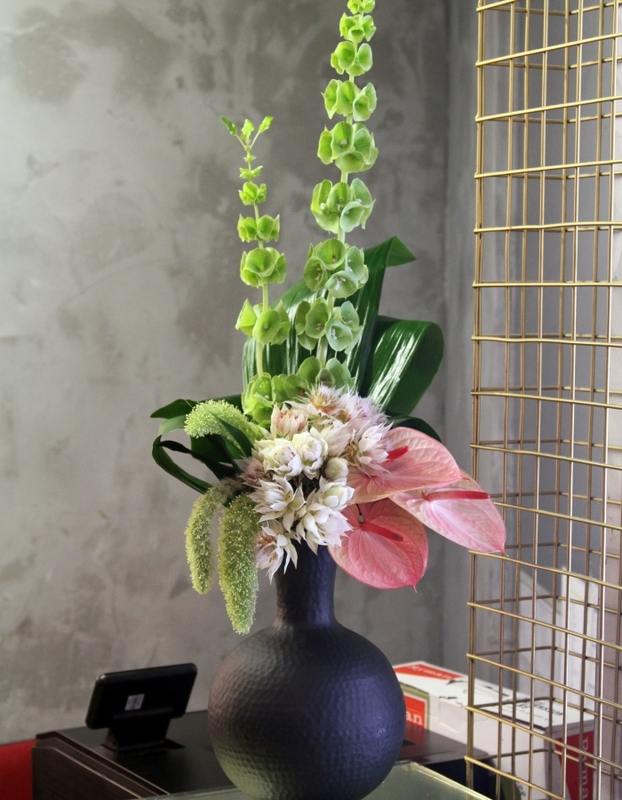 Hydrangeas, delphiniums, striking orchids, or large arrays of roses, dahlias and monochrome peony arrangements are some of my flower displays for hotels and lobbies. These are two somewhat opposite approaches. Succulents are subtle, varied, soothing and can tend to blend into the background, complementing your existing decor and atmosphere without competing for attention. 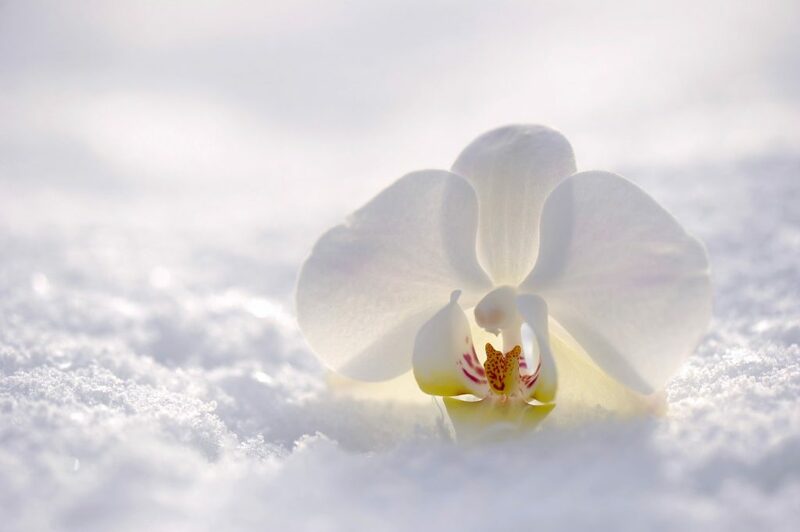 Meanwhile, orchids are elegant, alluring, and depending on which colour you choose–pink, fuchsia, magenta or purple, even a classic bright white–they can really stand out. What you pick depends on the look and feel of your business. 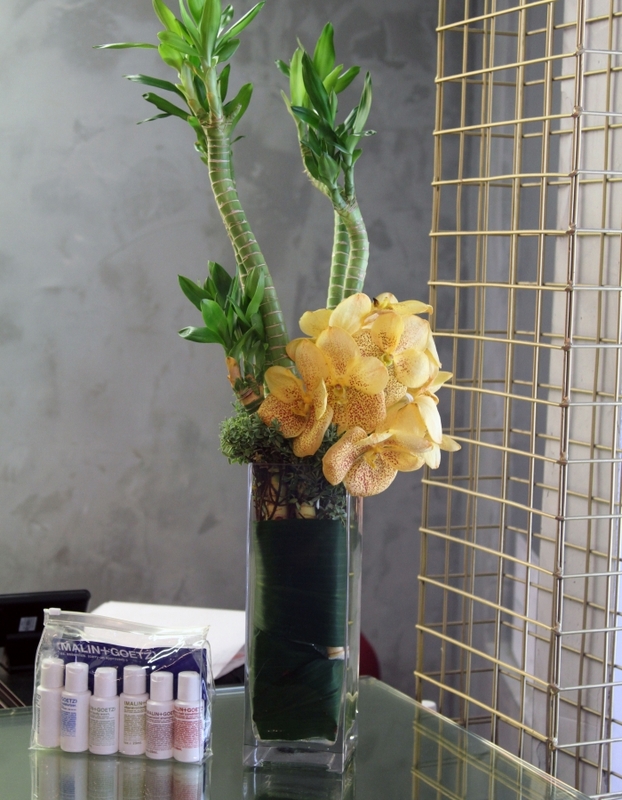 Still, succulents and orchids arrangements can function as the perfect accent, like a bridge between the lobby and guests’ rooms, in hallways, by lifts and waiting areas. Sweet peas. A gorgeous climbing flower that comes in fuchsia, pinks, purples and lavender. A wonderful textural addition for natural and cascading spring wedding bouquets. Roses. Classic, fiery and elegant, and enduring, roses speak to all aspects of your love. Put them in bridal bouquets, bridesmaid arrangements, table centrepieces and other wedding decor. Peonies. Feathery and pillow-like softness with a creamy smooth palette, peonies are hard to beat in a popularity contest. Brides just love them in all varieties: white, pink, rose and red. Ranunculus. Edgy and adorable all at once, a combination that’s made these popular wedding flowers year after year. Multiple layers of petals also create nuance and add complexity to arrangements. Colours are wide-ranging. Pick from hot hues like yellow, orange and red, cooler shades of purple and light pink, or neutral white and cream tones. Hydrangeas. Don’t forget about this majestic bunch–exquisite profusions of petals that are fun, beautiful as wedding centrepieces, table decor, and perfect as wedding flowers on a budget. Hydrangeas are definitely a wedding flower favourite. Everything is in bloom. Bright, beautiful blossoms are showing up in all sorts of floral displays and you want to put them all in your wedding. Of course you have lots of choices. Go white-on-white with magnolias or hydrangeas. Try shades of pink tulips, lilacs, or ranunculus. Or creamy, pastel peonies. Weather is always a factor, particularly if your heart is set on an outdoor wedding. But even for winter and fall weddings, you need to account for extra layers and guests who might be travelling from afar or between ceremony and celebration venue. Dorothy Polka from Polka Dot Bride advises: “Always, always have a wet weather contingency plan. Spring may seem like a sunny season for weddings, but in many places it can be wetter than winter! 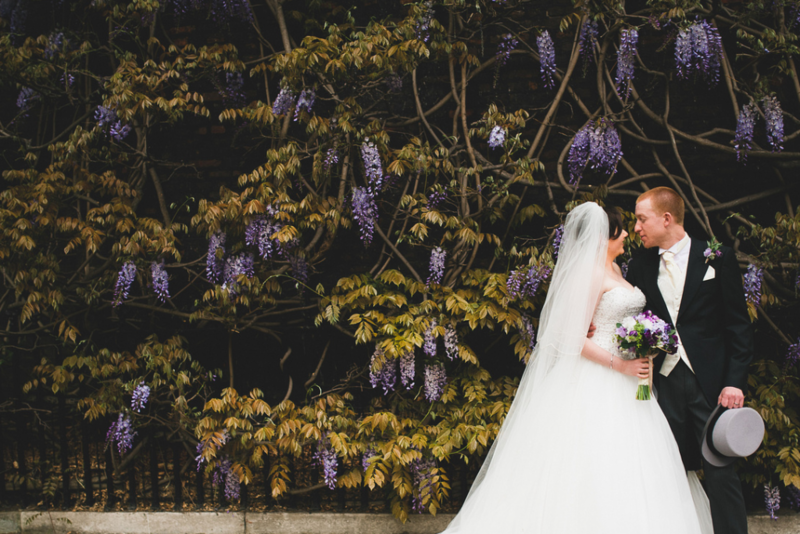 Maya Devassy Tarach, Certified Wedding & Event Planner at Preoccupied Bride, adds: “Spring is known for beautiful blooms and milder temperatures, but don’t forget the weather can be tricky. Since it is a season of rain and the remnants of winter are on their way out, it’s important to play it safe and have a plan B in place for outdoor weddings and guest comfort. Incorporate garden party themes, succulents as wedding decor, creative vases, and much more. Mix and match your in-season flowers. 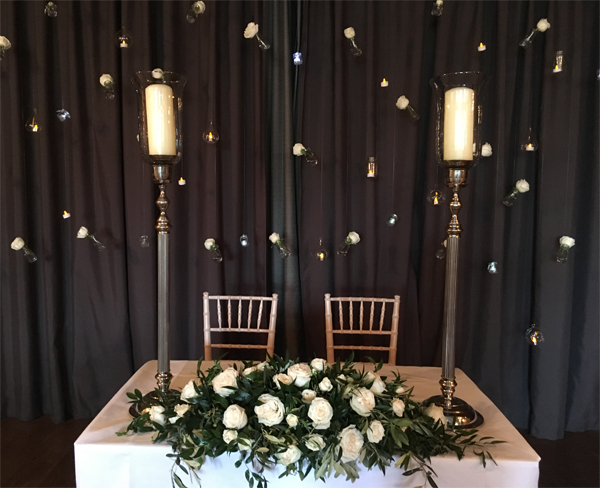 With the help of a wedding florist like Todich Floral Design, you can have your wedding on a budget by creatively using stems in bridal bouquets, bridesmaid flowers, table decorations and wedding centrepieces. 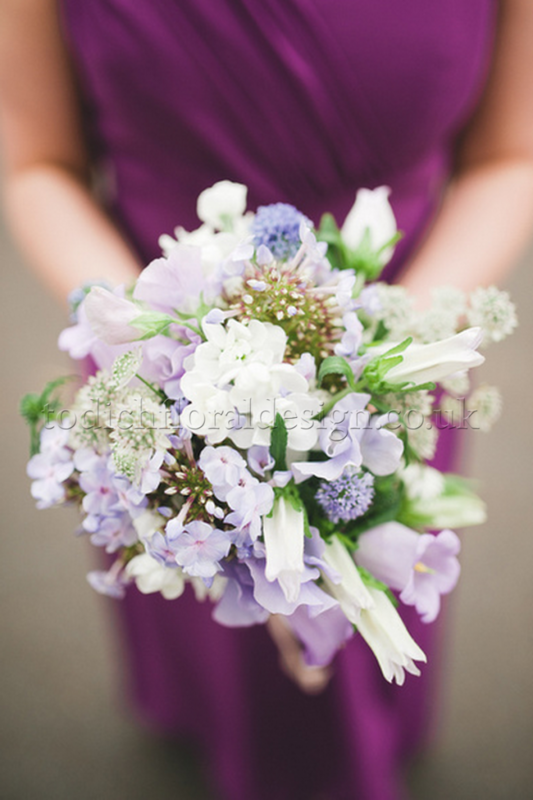 Lovely English Wedding Flowers, London Holiday Floral Arrangements! There is bound to be some overlap, right? Weddings, Christmas parties at home, events, holiday parties in the office–some people want their favourite flowers for every occasion. And we don’t blame them! Roses, roses, roses. Who can resist? Roses feel right in all seasons, and for so many occasions. At your wedding, they symbolise and celebrate your love. And all winter long, on Christmas and around New Year’s, you can allow their warmth to linger. Dhalia’s, darling, they’re marvellous! Precious, regal and captivating, dhalias are delightful and daring all at once, with petals that point and flare outward. White, blush, pastels, peach and pink, and creamy yellow shades from your bouquet design can also decorate your home around the holidays. Paper whites, the prettiest little crowd-pleasers. These are tiny little petals you just won’t want to look away from–paper whites, also known as narcissus, are dainty and delicate as a snowfall. Bouquet design is always a hot topic for discussion (one that you will want to have early on with your wedding florist), especially since year-round and seasonal wedding flowers can be ordered in groups or bundles that complement your other flower arrangements. Getting an accurate stem count and a sense for the number of blossoms in a centrepiece, your bridal bouquet, your bridesmaids bouquets and other wedding decor for your big day, will all help you keep within your budget. If you consider yourself traditional, or just really need something that says ‘Christmas!’ then try a red roses bouquet, a classic wreath, or a Christmas flower arrangement in a woven wicker basket. Pine cones, white candles, decorative angels, ribbon, baubles and your own favourite gold, silver or emerald ornaments are the crowning touches. Similarly, you may use some of those same wedding decor ideas and centrepiece flowers at New Year’s. What better way to celebrate your first, new year together?